The far left and the far right in this country have demonstrated renewed vigor in the last couple of years. First the right produced the Tea Party movement; now the left has Occupy Wall Street. Both groups are responding to many of the same economic and political issues — the recession, bailing out the banks, and Obama (though one group is reacting to his election and the other to his disappointing performance). But these two movements are being talked about, by the activists themselves, in very different ways. In particular, they have chosen very different memes with which to frame the movements. And these different choices reflect ongoing differences in the way the right and the left in this country generally approach activism. In his book, Cultural Dilemmas of Progressive Politics: Styles of Engagement among Grassroots Activists, Stephen Hart argues that activist groups form differing relationships with culture in the ways they frame and conduct their work. On one end, activists can embed their activism in existing cultures — drawing on stories, rituals, art, etc., to situate their work in larger cultural values, beliefs, and visions for the world. Hart calls this “expansive” discourse. On the other end, activists can circumscribe the way they talk about and conduct their activism, remaining close to specific practical and political issues, and avoiding larger systems of belief or cultural histories which are potentially divisive. Hart called this “constrained” discourse. In 2001, when the book was published, the right he was referring to was the religious right (still, of course, a major force) and the left various anti-war and community groups. He noted that, on average, the right did much more to embed their work in culture and use expansive discourses, while the left was more likely to use constrained discourses and stay ultimately focused on specific policies and single issues. The biggest exception, for Hart, was the faith-based community organizing movement on the left. A similar division can be seen if we look at the central memes for these newer political movements. The Tea Party movement’s core meme is, of course, the Boston Tea Party — that perennial symbol of the U.S. struggle for independence. The Tea Party narrative is part of the mythology of America; it definitely carries an economic meaning — anti-tax — but this is only the surface. The meme also carries with it larger values of individuality, freedom, liberty, and capitalism. While American mythology does not quite have the same deep roots as Christianity, this is still an example of a very expansive discourse that draws on deep foundational values and ways of seeing the world. 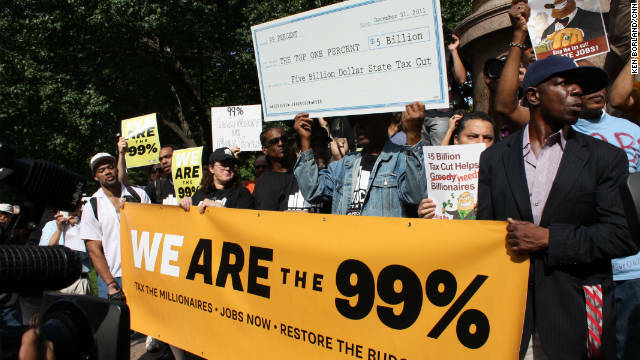 Occupy Wall Street has two central memes that have captured the attention of the world. The first is “Occupation,” a meme which implies a critique, or reclaiming, of the US’s oppressive foreign policy. (It also, as has been pointed out to me by a friend, has unfortunate resonance with the history of occupation of native lands — particularly when the protesters are mostly white.) The second meme is “We Are The 99%.” This meme is specifically economic; in fact one of the smartest things about it is that it serves not only as a political statement, but also serves as a small piece of political education about the vast gulf of inequality in the US. Despite the inclusiveness of these two frames, they remain very constrained in terms of culture — presumably in order to make room for people from many cultures to gather under one banner. This is not to say that Occupiers are not operating from a set of beliefs and vision for the world — we all are. But these different visions are subordinated to a larger frame that is more practical and constrained. Both movements have had their memes catch on beyond the original group, and so can both be seen as rather successful in their framing. But Hart argues in his book that constrained discourse can be limiting for progressive movements, leaving them unable to tap into deep wells of moral and value-rich resources. From this perspective, its not so much a lack of specific demands that could be a problem for the Occupy groups, but a lack of a cohesive and moral vision for the world, embedded in deeply held beliefs — not merely our economic interest. This lack could be limiting as we seek to turn a large-scale mobilization into a true social movement. Of course, any attempt to solidify a vision of the world will push people out who do not agree. A tough balance must be maintained between including these shared visions in discourse and action, while still making room for multiple perspectives. This would seem daunting, but I have seen it work. In studying community organizing groups, I have seen organizations draw on the cultural values and visions of religious institutions, while still drawing in atheists; I have seen them organize across races, with both recent immigrants and long-time residents, in a single, compelling, moral vision for the world. This takes more than mobilization though — it takes relationship building, coalition making, and a lot of patience. Some of that work seems to be happening on the ground at the Occupations, and will continue to be the work of the future.